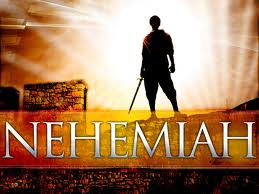 In the middle of the Old Testament there’s a flyover book called Nehemiah. It is often bypassed or quickly read as its seen as a straightforward historical accounting of the rebuilding of the walls around Jerusalem by a Hebrew leader named Nehemiah. It is actually an amazing depiction of God’s response to prayer, intervention in human affairs and protection of His people in the midst of their enemies. But even beyond that, Nehemiah is himself a symbolic picture of the Holy Spirit, that “comforter” who helps rebuild the broken rubble of our lives as He protects and restores our very soul, mind and will. Such is the richness of Scripture when seen in full context. The book of Nehemiah continues the story begun in Ezra. It is mid-5th century B.C. and some of the Israelites (Hebrews) had returned from their 70-year Babylonian exile, an 800 mile journey back to Jerusalem. Their beloved homeland had been invaded and destroyed 150 years earlier by the brutal Babylonian King Nebuchadnezzar (predicted in Habakkuk, experienced by Daniel, Jeremiah and Ezekiel). The invaders had thoroughly destroyed the walls of Israel’s capital, Jerusalem, and her central religious shrine, the temple. The temple was rebuilt under the leadership of Ezra, but the city remained exposed and in disarray. Most distressing to Nehemiah was that the surrounding city walls were still in ruins. Nehemiah served a Persian king and lived in Susa, the capital of what is now Iran. He was of Jewish heritage and ached for his once proud nation and people. No self-respecting city could operate without walls in vulnerability to marauders and looters from surrounding cities of their enemies. After praying and confessing on behalf of the people of Israel for their rebellion and disobedience against God’s “commandments, statutes and ordinances” given to Moses (see Nehemiah’s prayer 1:5-11), Nehemiah approached the king and received permission to go to Jerusalem to rebuild the walls. The king even provided supplies and letters of passage. The rehab work was a group task with people from all walks of life – rich and poor, men and women, skilled and novices – joining the effort. They each built the section nearest their own homes since they had a vested interest in making sure they were secure. Years ago I went through a study on Nehemiah by the great Pastor Jack Hayford who noted that the name Nehemiah in Hebrew actually means Comforter. This insight opened up new perspectives on this historic scriptural narrative. Typology – study of types and prefigurative symbols – is common in the Bible. For instance, Moses and David are shadow precursors to Christ. The Hebrew Passover event in Egypt is symbolic of the saving blood of Christ. There are many more. Nehemiah, as a picture of the Holy Spirit, gives us a view of how we can be restored and renewed from the broken rubble of our sinful past while we are reassured and protected from mockery, guilt and shame from our own selves and/or our Enemy/Adversary. Just as the resettled Israelites had reestablished worship with the rebuilt temple, we can all reestablish our connection with God through acceptance of his atoning sacrifice of His Son, Jesus, on the cross. Yet the Israelites were still vulnerable, exposed and shamed by the rubble around them as a constant reminder of their past disobedience. Likewise we may worship God but are still weighted down by past sin, shame, self-doubt and remnants of brokenness of our human personality. The Holy Spirit, our Comforter, intercedes and protects us as He directs a rebuilding of our human mind, soul and will. Do you know you have Helper, a Comforter, the Holy Spirit to rebuild and restore your own brokenness?